God said… Nine times we see “God said” in the first chapter of Genesis, as the Creator of the universe spoke all things into existence. What did God speak? Words, naturally. The Word, actually. The writer of Hebrews agrees, saying, “through the Son He created the universe” (Hebrews 1:2, NLT). Likewise, the Apostle Paul tells the Colossians that “through Him God created everything in the heavenly realms and on earth… Everything was created through Him and for Him” (Colossians 1:16, NLT). From these verses we know that 1) God spoke the universe into being, and 2) God created the universe through Christ. Obviously, there’s a direct correlation between Jesus and God’s word. How interesting that Paul equates the word of God with the sword of the Spirit in his epistle to the believers at Ephesus: “Put on salvation as your helmet, and take the sword of the Spirit, which is the word of God” (Ephesians 6:17, NLT). Infinitely greater than any weapon forged by man, “the word is living and active and sharper than any two-edged sword… able to judge the thoughts and intentions of the heart” (Hebrews 4:12, NASB). How vibrant these verses become when we see that sword as the Savior himself! During His time here on earth, Jesus certainly did judge the thoughts and intentions of the people He encountered. (Have a look at Matthew 12:22-25 and Luke 7:39-40 for some examples of Jesus knowing men’s thoughts.) And as God famously told the prophet Samuel, “man looks at the outward appearance, but the LORD looks at the heart” (1 Samuel 16:7, NASB). Air—or more accurately, breath—is required in order to produce speech. So, let’s look at some references to God breathing, as recorded in the Bible. One of the best-known instances has to be Paul’s words to his protégé, Timothy, when he said, “All Scripture is God breathed” (2 Timothy 3:16, NIV). 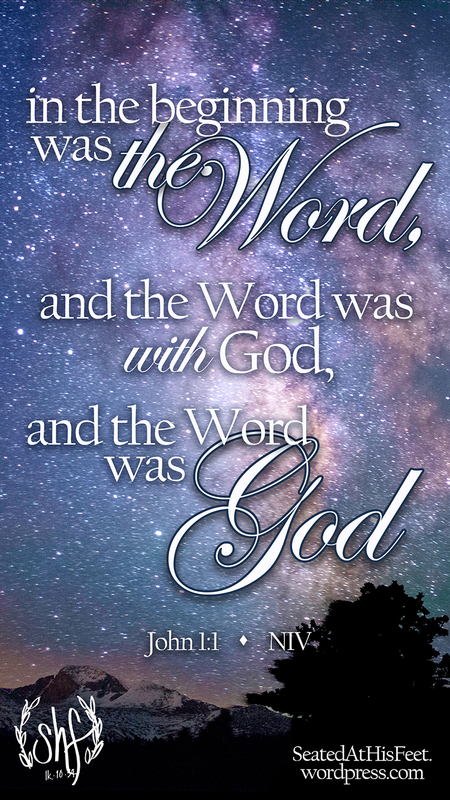 How fascinating that the words of Scripture were breathed out by God, just as He would have breathed out the words that brought about Creation. Speaking of Creation, we should note the single exception to God’s method of speaking Creation—that of the first man, whom God personally and intimately formed from the dust with His own hands. But even then, “God breathed into his nostrils the breath of life and he became a living being”(Genesis 2:7, NLT). Similarly, Jesus breathed new life into His disciples when He first appeared to them after the Resurrection (John 20:22, NLT). So, now we can add to our earlier list of things we know, 3) The breath of God gives life. When we quote verses from the Bible… When we speak the truths found in Scripture… When we pray the prayers recorded in the Gospels, we bring the very presence of Jesus to bear on the situation. Our God is “a very-present help” in our time of need (Psalm 46:1, KJV), and He is never closer than when His Word is on our lips.